It was dubbed the “Rose Mary Stretch”, and it became an iconic image of truth-stretching in the Watergate era. 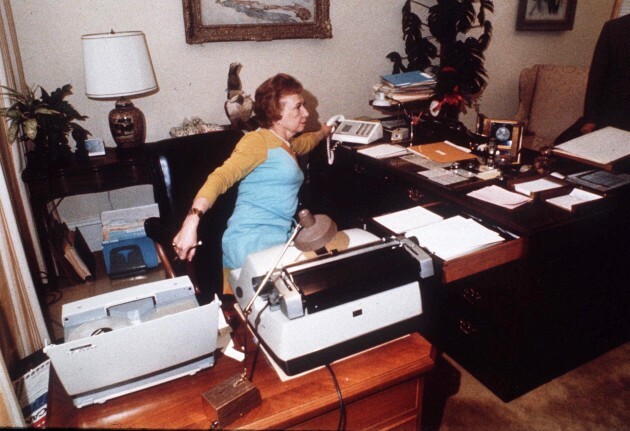 Arched awkwardly backward to answer the phone, the ever-loyal Richard Nixon secretary Rose Mary Woods demonstrated to prosecutors how her foot errantly tapped the record button, causing part of a crucial 18 ½-minute gap in an Oval Office tape. “I am most dreadfully sorry,” she said. Her epic bend of back and logic made her a national punch-line, and helped push her boss to early retirement less than a year later. Ms. Woods died in 2005 at 87. But her infamous Pilates move lives on. There is an annual award for “worst performance in open government” in her honour, and a play called Stretch (A Fantasia). This entry was posted in Uncategorized and tagged annual award for “worst performance in open government”, “18 ½-minute gap” in an Oval Office tape, “Rose Mary Stretch”, Barrie McKenna, conspiracy, errant footwork, foot, gaffe, iconic images, impeachment, legal evidence, loyalty, movement, November 26 1973, Oval Office, play named “Stretch (A Fantasia)”, political intrigue, politics, President of the USA, privacy invasion, prosecution, prosecutors, re-enactment, record button, Richard Nixon, Rose Mary Woods, scandal, secretary, shoes, taping conversations, Watergate. Bookmark the permalink.